The Mortgage Bankers Association (MBA) today released its Weekly Mortgage Applications Survey for the week ending May 21, 2010. "Refinance application volume jumped last week as continuing financial market turmoil related to the budget crises in Europe extended the opportunity for homeowners to lock in at historically low mortgage rates...In contrast, purchase applications fell further this week, following last week's sharp decline, keeping the purchase index at 13-year lows." The Mortgage Banker's application survey covers over 50% of all US residential mortgage loan applications taken by mortgage bankers, commercial banks, and thrifts. The data gives economists a look into consumer demand for mortgage loans. In a low mortgage rate environment, a trend of increasing refinance applications implies consumers are seeking out a lower monthly payment which can result in increased disposable income and consumer spending (or give consumers a chance to pay down other debts like credit cards). A rising trend of purchase applications indicates an increase in home buying interest, a positive for the housing industry and the economy as a whole. The Market Composite Index, a measure of mortgage loan application volume, increased 11.3 percent on a seasonally adjusted basis from one week earlier. On an unadjusted basis, the Index increased 10.3 percent compared with the previous week. The four week moving average for the seasonally adjusted Market Index is up 4.4 percent. The Refinance Index increased 17.0 percent from the previous week. 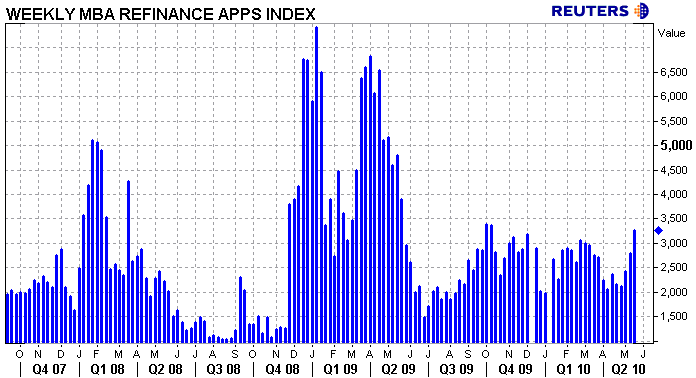 This third consecutive increase marks the highest Refinance Index recorded in the survey since October 2009. The four week moving average is up 11.5 percent for the Refinance Index. The refinance share of mortgage activity increased to 72.2 percent of total applications from 68.1 percent the previous week, which is the highest refinance share observed in the survey since December 2009. 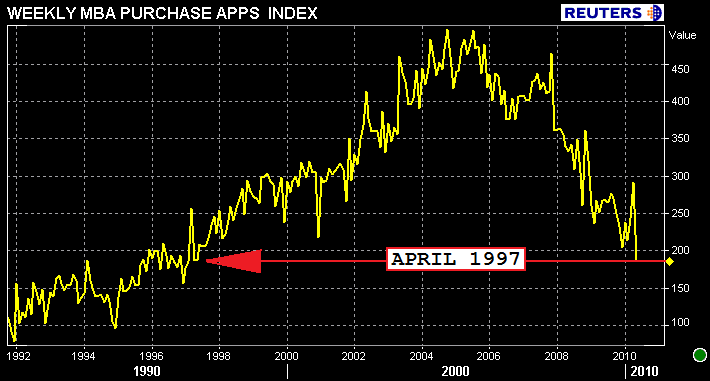 The seasonally adjusted Purchase Index decreased 3.3 percent from one week earlier and is the lowest Purchase Index observed in the survey since April 1997. The unadjusted Purchase Index decreased 4.0 percent compared with the previous week, was down 27.1 percent over the past 4 weeks, and was 27.5 percent lower than the same week one year ago. The four week moving average is down 7.2 percent for the seasonally adjusted Purchase Index. The average contract interest rate for 30-year fixed-rate mortgages decreased to 4.80 percent from 4.83 percent, with points remaining constant at 1.08 (including the origination fee) for 80 percent loan-to-value (LTV) ratio loans. 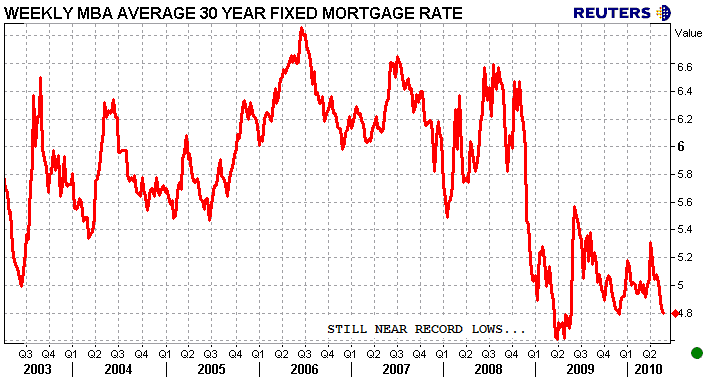 This is the lowest 30-year fixed-rate recorded in the survey since the week ending November 27, 2009. The effective rate also decreased from last week. The average contract interest rate for 15-year fixed-rate mortgages increased to 4.25 percent from 4.19 percent, with points decreasing to 1.00 from 1.36 (including the origination fee) for 80 percent LTV loans. However, due to the decrease in points, the effective rate decreased from last week. The average contract interest rate for one-year ARMs increased to 6.83 percent from 6.81 percent, with points increasing to 0.38 from 0.37 (including the origination fee) for 80 percent LTV loans. The adjustable-rate mortgage (ARM) share of activity decreased to 6.0 percent from 6.3 percent of total applications from the previous week. This week's read on the purchase market is consistent with anecdotal accounts offered by the MND community and our own industry contacts. Loan writers are generally busy trying to get their homebuyer tax credit files through underwriting and closed before the June 30 deadline---however new purchase applications have flatlined. This does not come as a surprise to anyone. The rise in refinance applications is also consistent with anecdotal accounts offered by the MND community and our own industry contacts. As a flight to safety drove mortgage rates lower and lower over the past few weeks, originator phones rang progressively louder. This is great news as it implies consumers are seeking out a lower monthly payment which can result in increased disposable income and consumer spending. Unfortunately, a loan application does not equal a closed loan and there are a few roadblocks pressuring pipeline fall out higher. We're hearing complaints SPECIFICALLY about appraisals. Borrowers looking for a lower rate are not qualifying for an agency loan product because their home value doesn't support a rate/term refinance. Some say the AMCs are lazy and have no incentive to care whether or not their choice of comps accurately supports value. Others are a bit more quantitative in their approach and point toward an increase in foreclosure rates as the true culprit. On one hand we know that most qualified appriasers are not working for AMCs because they don't earn a full paycheck from their 1004s....which implies the AMCs are operating with a junior varsity squad of collateral appraisers. This stance is however hard to qualify as most of the horror stories we hear come from loan originators who just had their deal shotdown by a shoddy appraisal. The theory is hard to overlook though. Plain and Simple: Bank foreclosure activity is putting more distressed inventory on the market and making it harder for appraisers to justify their choice of comps. It's a buyer's market...distressed sales will continue to drive collateral values lower, especially in highly concentrated areas of foreclosures. So while refinance applications are higher...we gotta get'em qualified and closed before we can start adjusting prepayment speeds higher. While it may be a mortgage professional's first instinct to blame appraisers who didn't dig deep enough to determine fair market value, in many cases this may be an unfair assumption. Appraisers must know their market, they must research each active listing and sale to determine what is driving home prices in that specific area. If short sales and foreclosures are predominant, we shouldn't be criticizing the quality of appraisals. If the appraiser simply used the last four sales in the market as comps or just missed recent sales that were not a foreclosure or a short sale, then an originator is justified in questioning value. WHEN CAN AN ORIGINATOR QUESTION AN APPRAISER? I finally got some justice for a client who had their house appraised for $348,000 when the borrower thought it was closer to $400,000. Contacted the AMC and pointed out that the square footage was wrong, and the appraiser completely missed a bathroom and a bedroom. Also, all of the comps used were over 6 months old, and there were fresher comps available. They asked the appraiser to double check--no change in value. I had two appraisers I know who live close to the subject pull comps and drive by the house. Both of them thought it was in the $390,000 to $395,000 range. We were told we could order a new appraisal through the AMC and if it came in at least 10% higher there would be no charge. Ordered it, gave the borrower the newer comp sheets, and a copy of an old appraisal with the correct square footage to hand to the appraiser, and when it came back--$390,000. Most AMC appraisers are just lazy. You almost have to do their job for them to get the correct value. Repeal HVCC now! Ordered an appraisal that came in at $481K. Underwriter requested a desk review, because she said she "didn't like the way it looked" (regardless of the fact that it was done by an appraiser from the bank's own AMC). Desk review came back at $495K, which the underwriter also didn't like, so she ordered another desk review by a third appraiser. That one came back at $465K, which didn't include ONE closed sale (the first two had 3-4 closed sales and listings to support their values), and only used comps. from listed and/or pending short sales that were further away from the subject property than the first two appraisals. Guess which "appraisal" the underwriter liked best? You got it, the lowest value that just happened to violate all basic rules of appraising by not including even one closed sale. HVCC is just typical govt. overreaching into private sector businesses, which the lenders are now using as an excuse not to loan money. Oh, by the way, I will NEVER submit another loan to that particular lender again. In my opinion a stronger case should be made for not including foreclosures and short sales to the comps that an appraiser is required to find for a property that is not distressed. First of all most of the foreclosures and even a good deal of the short sales are in horrible condition with many of them stripped of everything that can be stripped. I even showed one where the hot water heater, the furnace, the cabinets, the door knobs and light fixtures had all been removed. Others have had lack of upkeep and care for quite some time. After all, if someone cannot make their mortgage payments, can they take care of the home? In my experience, no. So, why should the homes/homeowners in those communities who have taken care of and even improved their properties suffer for this when they have done everything right? Their homes are not really comparable with these other products and just because they may be within a certain location proximity does not make them a comparable. If this practice were discontinued, we would not have the appraisal issues that many are now facing. Or, if the appraisers were required to physically go into those foreclosures and shortsales and do the calculation of what it would take monetarily to bring them to what could be considered comparable, it would help the problem. In other words, what would the house have sold for if it were in any kind of decent condition. Instead, what is happening is that the distressed sale price and square footage seems to be all that is being used. So, we have a lot of people who have great homes suffering for those that have experienced tradegys and/or who have jumped on the bandwagon whether they have had misfortune or not, thereby increasing the housing problems even more. It seems like it would make more sense to just eliminate those distressed properties from the calculation completely. After all, once they are sold and brought back to the condition they should be in, won't they re-gain the inital value they would have had? And in the meantime, the community/neighborhood would have maintained it's initial value as well which just helps everyone, including the banks. This may be over simplification but having shown many of these homes, it seems to me that using the distressed homes as comp for something not distressed is like compairing apples to oranges, yes they are both fruit but nothing like one another in any other way. I used to think the AMC appraiser was to blame, but after doing some "post-mortems" of deals that were killed via HVCC I am seeing other wise. What is happening is that a lot of these AMC's are acting as overlords of what value is. They kick out comps, demand lower comps etc. I called the appraisers themselves, and that is directly from them. Companies like LSI are the worst. They keep things in "quality review" for days, and basically tell the appraiser what comps to use. Then why did the appraiser even do the report? There is a lot of pressure from the lenders to have conservative appraisals. We have time after time proven them wrong with different comps, and of course they come up with some BS reason why they can't use them. They will NEVER admit they were wrong. And even if you get an appraisal through that comes in, an underwriter can summarily just kill the deal. No reason....just "i don't like it". That is the reason I get. This HVCC stuff needs to end. As a member of the appraiser community, I think everyone in the loan industry should be upset with the underwriting guidelines of the banks. They are the ones setting up guidelines as to what they will accept (comps with 90 days, less than a mile). Appraisers are being completly handcuffed and not being allowed to do their job and create a credible report. Also, if you have not noticed, home values are falling rather quickly with most homes purchased or refinaced within the past 10-11 years being underwater. I can not believe what I am reading as of late that appraisers are killing deals. First we were blamed for over appraising homes and helping create the housing bubble to now we are killing the market for under appraising. You can not have both ways. For every 1 bad appraisal I can find 10,000 good ones. Just like for every broker that sold a 10% rate to an old lady you could find 10,000 that would have sold them a 9.875 rate. Everybody is to blame with nobody taking resonsibility. STOP BLAMING APPRAISERS AND VOTE THEM ALL OUT. Can we really "vote out" the underwriters??? If you call 5 different lenders underwriters and ask them their guidelines regarding the GFE2010 you will get at least 5 different sets of guidelines! I thought this law was supposed to be the one thing that we could depend on! Everyone using the same measuring stick...? I guess I was way off there! Bad appraisals? You get what you pay for. The AMCs scrape the bottom of the barrel for submissive appraisers who in turn must cut corners in order to mitigate their lowball fees. They are not independent appraisers. The loophole in the rule against suggesting target values is by rejecting the appraisers choice of comps until he/she arrives at the AMC's desired combination. This is a form of manipulation that the regulators overlooked. HVCC does not require the use of AMCs. Read the rules. I agree with you Susan, and Michigan appraiser. I've been in the mtg. business since 1985, and it actually used to be fun, and a healthy market where if defaults ran above 1.2% there was a problem. If you originated a loan that the borrower missed a payment, you were required to call that borrower and figure out what their situation was, and typically it was a divorce or death in the family. Now, after 25 years of steadily more and more govt. regulation and influence, you get the mess that we are in, with over 10% defaults, and a govt. that caused the problem with too much involvement pretending that the solution is further overreaching into the private sector. Housing, lending, appraising, etc. will continue to be in a death spiral until the market is able to act on its own. Looks like you all are getting it. The "regulators" and the banks' spin doctors managed to point the blame at LOs and appraisers while trying to avoid the obvious. Question: Who in the the process of a a real estate transaction is the key figure? Everybody from listing broker to loan rep to processor, title officer, appraiser, etc., on through the closing agent. A lot of people involved but only one out of that group approves the loan. Answer: the UNDERWRITER. All those bad loans contributing to the meltdown were approved by UNDERWRITERS,no one else in the process. No one else had the authority. So why is everyone but the UNDERWRITER required to be licensed, credentialed, scrutinized or, for that matter, blamed for the subprime fiasco? Why the free pass? I have to partially disagree with part of your conclusion, O. It wasn't stated income loans, interest only loans or option ARM loans that were the problem, however they are certainly blamed as the primary culprits. I have written hundreds of millions of dollars of stated income, interest only and option arm loans with very little defaults. The primary cause of the housing/banking liquidity crisis was govts. push for an "ownership" society, where they convinced themselves that it was a right for everyone to own their own home. When it was obvious that not everyone qualified, they pushed stated income products with NO DOWN PAYMENT products so everyone could qualify, at least on paper. When there was nothing to underwrite (no assets, no income, no down payment, and lousy credit was acceptable), but the bank would loan the money anyway, I don't see how you can place the blame on the underwriters - I know first hand that the executives of the banks pushed them to approve anything that came across their desks because there was no recourse for a bad loan when it was all sold on the secondary market anyway. The problem was stated income loans, at 100% financing - which created an incentive for people to mail in the keys when the loan became unaffordable or the value dropped. Because most of these loans also happened to be either option arms or interest only, unfortunately they get the blame. I can tell you unequivocally when we required 30% down payments and 720 or above credit score for stated income products (which require very minimal underwriting), very few to none of those loans went bad. Just my two cents worth, but I like the debate. Bryan....the governement did not force the subprime lenders to provide 100% stated programs. Believe me...I am no fan of big government, but I have been in the industry myself for a decade or so and the problem was greed and lack of self discipline within the industry. Plain and simple. We did a horrendous job of self regulating during a time when most folks who were worth a damn in our business were clearing $200K+, many of them without a lick of education or true knowledge of the products they were selling. Now we have provided a chance for Uncle Sam to say "I told ya so" and try to over regulate. To some extent we are reaping what we sowed. I truly am tired of both sides of this political debate. One side says we should all burn in hell and need the government to come in and set things straight, while the other side says it is all "Big Brother's" fault. It is just stupid. I can look myself in the mirror and say that some of the products out there in the first half of this decade were insane and could have used a bit better oversight. At the same time I can say that most of the regulations being put in place now are largely ineffective and in most cases only serve to corrupt the process or make it too damn confusing for anyone to understand. What we need is a happy medium, and until either we or some politicians who aren't so concerned about firing up the base to get re-elected can come together on some decent solutions...we are stuck with what we have. It is so funny how politics work....our two party system has become entirely too effective in an opposition role and too terribly ineffective at actually running a country. This constant back and forth without accomplishing anything is a microcasm of our industry. I just hope that at some point when people aren't running scared whether it be underwriters, appraisers, originators, or borrowers we can all come to some kind of basic agreement about what works to protect the product and the people buying it without making too prohibitive to profit from. I think this time will come, but not for another 5-10 years. "We're creating... an ownership society in this country, where more Americans than ever will be able to open up their door where they live and say, welcome to my house, welcome to my piece of property". - President George W. Bush, October 2004. Jason - I agree with most of your statement, but I think you're minimizing the govt's complicity in the 100% financing. I did not say the govt. "forced", but "pushed" the lenders to make 100% loans. You're absolutely correct that both parties are to blame, so I don't think a political debate is warranted. However, regardless if the govt. force, pushed, encouraged, twisted arms for lenders to write 100% loans, they obligated tax payers money for this enterprise through fnma and freddie mac, which I find personally offensive since I pay a ton of money in taxes (and I'm sure you do too). Those and other GSE's should have been abolished years ago, and any lender that chooses to write a 100% loan should be forced to keep it in their portfolio (i.e. none would be written). Not arguing with you, but I think you are being too light on the govts. involvement in creating (and now thinking it can correct) this mess. John, I am appraiser and I have to deal with UWs that try and act like they are appraisers when they are not. Most, if not all UWs dont have a clue when it comes to looking at an appraisal report, they just are a bunch of list checkers. UW are not quailified or licensed to evaluate a report done on a professional level. I have had UWs attempt to tell me which sales I should use or what adjustments to use etc etc. I have to put them back in their place and remind them they are list checkers not appraisers and they cannot ask an appraiser to do those things. An UWs opinon is not a professional opinon of value. UWs are compliance only, they can only ask why something is or isnt in a report or ask for additional information to clarify something in the report that is on their "check list" they have. Of course with this new law coming up for vote july 4 that requires a licensed appraiser to do all reviews on any report, UWs will no longer be reviewing reports nor AMCs flunkies that make minimum wage, for any report that is used for a federal transaction(which basically is all reports used for a loan). That law is word in such a manner to will kill HVCC for the most part if it passes. Because of a short of appraisers who are will to do appraisals at $175 to $200. Banks are using BPO's and AVMs and passing them off as appraisals. They are charging the home owner $300 and keeping all of the money. If you are a homeowner and the bank refuses to give you a copy of the appraisal this is probably the reason why. There are also a lot of bad appraiser out there too the appraisers who are willing to do appraisal reports for $175 to $200 are shortcut artist and don't do there due diligence to complete the appraisal they usually complete there appraisal reports in 4 hours. John, I think you are greatly exaggerating that "you know more than appraisers". Until everybody in the "loan industry and R/E sales industry is paid by salary and not commision, appraisers will alaways be incompetent. You got to be kidding me- do you know how many deals that I came under value on for refinace that the L/O or homeowner complained about that the number they thought the home was worth was-oh lets say- magically worth what the number needed to be for the deal to work. Those in the loan industry and r/e sales industry are a bunch of winers as well as appraisers that wine about the HVCC. The reality is that the whole country is in for a wake up in the next few months. Instead of crying about deals that went south, you should have squirreled away all the money made over the past 10 years-appraisers too. Grow up already. I purchased my house in 2006 for $242,000. House 2 doors down just sold for $176,000 as a private sale. Who do I blame when I can not refi? I am certainly not imune to the market so why should all you L/O and R/e agents be imune to it in regards to your deals. BTW, i think the whole market as well as wall street is going to collapse this fall as we are now seeing that the financial world is proped up by the US govt and IMF. What happens when these secondary countries start to fall? They do not have a printing press. California is near bankruptcy. All municipalities near me are laying off workers. Where do those workers get jobs-they fill for their pension that no longer is fully funded. And for petes sake-Kwame just got 5 years. Due to a shortage of appraisers who are willing to do appraisals at $175 to $200. Banks are using BPO's and AVMs and passing them off as appraisals. They are charging the home owner $300 and keeping most of the profits for themselves. Remember 3 big three banks own the 3 biggest Appraisal Management Companies. If you are a homeowner and the bank refuses to give you a copy of the appraisal this is probably the reason. There are also a lot of bad appraiser out there too. I am talking about the appraisers who are willing to do appraisal reports for $175 to $200. They are shortcut artist and don't do their due diligence to complete the appraisal report properly and completely. These cheapy appraisers usually complete their appraisal reports in 4 hours or less and the homeowners suffer the consquences. With BPO's where the agent has a selfish motive to list the property low so they can sell it quickly or AVMs which are controlled by the bank and don't take into consideration the money the owner put into the property fixing it up. Another problem is bank mostly order drive-by appraisal so the appraiser can not see the inside of the property. So they can not appraise it properly. Hey John why don't you report those appraisers to the state board and find you some more qualified appraisers. That is your fault for not finding the most qualified appraisers to appraise your property. All appraisers are not created equal you should require work samples and have an appraiser fee panel to work from. Jason summarizes the problem with our industry perfectly: Plain and simple. We did a horrendous job of self regulating during a time when most folks who were worth a damn in our business were clearing $200K+, many of them without a lick of education or true knowledge of the products they were selling I've posted dozens of times in the last year for ideas that we could suggest to self-regulate our industry, even an alternative to HVCC about 2 weeks ago, as well as an alternative to loan modification money being flushed down the taxpayers toilets. You know what I heard? Crickets. If there is no voice of leadership within the housing industry, with viable, well laid out actionable alternatives to government proposed regulations, then the government will be content believing they are fumigating the lending/housing industry rodents they perceive caused the infestation of predatory lending and house selling practices that caused the 2nd biggest economic downturn in our history.